"SSRI discontinuation symptoms... may emerge when an SSRI is abruptly discontinued, when doses are missed, and less frequently, during dosage reduction. In addition, the symptoms are not attributable to any other cause and can be reversed when the original agent is reinstituted, or one that is pharmacologically similar is substituted. SSRI discontinuation symptoms, in most cases, may be minimized by slowly tapering antidepressant therapy, but there have been several case reports where symptoms occurred consistently even through repeated attempts to taper therapy. Physical symptoms include problems with balance, gastrointestinal and flu-like symptoms, and sensory and sleep disturbances. Psychological symptoms include anxiety and/or agitation, crying spells, irritability and aggressiveness." Symptoms described as "brain zaps", "brain shocks", "brain shivers", "brain pulse-waves", "head shocks", "pulses", "flickers", or "cranial zings" are withdrawal symptoms experienced during discontinuation (or reduction of dose) of antidepressant drugs. These result from a global downregulation of serotonin receptors in response to increased levels of serotonin in the synaptic cleft, but the specific mechanism through which this creates symptoms is not understood. Common responses to dose reduction or cessation include dizziness, electric shock-like sensations, sweating, nausea, insomnia, tremor, confusion, nightmares, and vertigo. The MedDRA "preferred term" for coding these types of symptoms in adverse drug reaction reports (for use in pharmacovigilance databases such as under the Yellow Card Scheme) is paraesthesia. I could take the “brain shivers,” the vertigo, nausea, and loss of fine motor control. I literally rolled with the punches when my sense of balance short-circuited and from a stand-still I found myself tilting over to meet the floor. I could even take the urges to cry at the drop of a hat (watching the Academy Awards was interesting. I have no vested interest whatsoever in the Academy, and saw a total of maybe two of the films that were up for awards this year. And yet, every single act of badly-performed sincerity had me reaching for the Kleenex box). But the plummet in my self-esteem, the anxiety, the panic attacks that did their best to sneak up and knock me down out of the blue multiple times a day, the seething roiling pit in my stomach that would not go away for three weeks straight—I’ve navigated this cliff’s edge before, and had no desire to once again pretend that everything was fine as I secretly slid further and further down that mud-slicked slope into darkness. I’ve been on antidepressants (name one, and I’ve probably tried it) since I was a sophomore in high school. Fifteen years. Half of my life. I’d be the first to admit that without their assistance in leveling out my chemical imbalances, I probably wouldn’t be here today. Most certainly not in the positive situations and conditions I find myself in today. In exploring the past with Omma, discovering her own history of anxiety disorder and depression was a revelation. This perpetual han—like my smile, my sense of humor, or a predisposition to heart disease—is an inheritance. And I honor this inheritance by acknowledging it, by addressing it with the necessary psychological and medical help. And yet, in today’s hegemonic society, the shame and stigma persists. In tenth grade (coincidentally, the same year I started taking Paxil), I sat in the front row in class as my high school psychology teacher lamented that his friend who couldn’t deal with his depression on his own now had to take antidepressants. “It’s such a shame,” I remember him saying with a shake of his head. “He’s going to be dependent on these drugs every day for the rest of his life.” To this day, I regret not raising my hand and asking him whether he would see it as a similar weakness of character if his friend had had to rely on a daily pill to manage his high blood pressure. Did I subconsciously take my psych teacher’s prejudices against mental health? I admit, my formative high school years were spent trying to live up to anyone and everyone’s opinions on the construction of the ideal subject. But more of it has to do with convenience in my day-to-day life. Not being on antidepressants meant not having to deal with their side effects (lethargy, problems sleeping, my reaction to caffeine, etc. ), not having to refill my prescription at the pharmacy every month, not having to schedule a check-in appointment with the student health services psychiatrist (who creeps me out just a little) every three months, and paying the medical services copays. But these are small prices to pay for mental and emotional well being. So I see my return to SSRIs as not a failure, not as a character flaw, but as a reaffirmation of my right to wellness. A small victory in self-regulation, of recognizing my need for help, catching myself before things snowballed out of control. This is me taking control, exercising agency, and believing I deserve to be happy, and don’t have to struggle on my own. 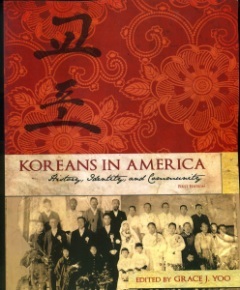 Professor Grace Yoo’s seminal textbook, Koreans in America is finally available for purchase publically! Definitely reasonably-priced, and chock-full of contributions from some of the most brilliant Korean American scholars and community organizers out there. Grab your copy today!